The Great Westminster Clock is a cherished monument and perhaps the world's most special clock. Its 15 ton bell, "Big Ben", is a familiar chime. And its 660 pound pendulum swings back and forth every two seconds. The Clock is known for its accuracy of about "a second per week". But the weather is causing significant variation. As with most clocks, any change in pressure, temperature or humidity causes the rate to drift by seconds per week. To compensate for these constant changes, the "Clock men" must put a penny on (or take a penny off ) to alter the rate by about 4.6 tenths of a second per day. But this only resets the clock and does not improove its accuracy. As of 2009, some of the old coins were replaced by a larger 5 Pound Coin. But re-setting the clock remains a constant chore. The Great clock does not need these jerry-rigged additions. It could run true - in all weather. In 2016 I proposed a special restoration which would make the clock run accurately --the perfection of Big Ben. Changes in the weather can be compensated for by surprisingly simple adjustments to the clock. These are subtle. But they are in keeping with the clock's historic nature and are designed to be "right" for the antique mechanism. They can properly correct the clock's (non compensating) design. Currently the clock corrects for temperature. (although slowly) This could be improved to compensate for people coming and going which also affects temperature. People breathe. This causes humidity changes which affect the going. The building can be climate controlled. But visitors still make an impact. Footfalls and street traffic can also cause error. These can be partly alleviated by rubber flooring and smooth paving. Even the drive train of the clock has minor use criteria which can improve precision. The major need is to correct for pressure changes. It is impractical to control pressure in a building with doors and windows. But pressure can be compensated. Normally a clock's pendulum is isosyncronus, such that changes in the amplitude of swing cause no difference in timing. However, changes in the atmosphere disrupt that perfection. The sister clock at trinity college in Cambridge has tested some pressure correction methods. But they are not historic to the clock. And there are issues of precise adjustment. So new methods were needed. To correct 'Big Ben' I have developed unique and special methods which are familiar to the clock's historic place in time. Already sophisticated computers measure performance and are a great aid in monitoring accuracy. But a fine clock needs to compensate for the weather. And the basic adjustments need to permit highly accurate tuning. A pennyweight is hardly sufficient to set the tempo. One might as well leave a pint on the pendulum and it could be set more quickly - and more often. Of course the clock is meticulously maintained and operated, but its fundamental tuning remains incomplete. In my Career I have designed or invented a number of superlative things valued in billions. So it is reasonable to accept that I have also found the right methods for the Westminster Clock. I am happy to say that such adjustments to the clock would correct the going with exceeding precision. Physics is perfect. So the clock should be perfect. It is an element of praise that we should make the effort. The quantum wave of our world will be a little more perfect. And the implementation will not change the historic nature of the clock mechanism. One could argue that any change would be non historic. But why add pennies, electric motors and computer monitoring? These are in use already. Yet we want to maintain the original escapement design. And I can. The weather is a significant factor in the clock's accuracy. But elegant and subtle adjustments can be made to the clock which will keep the timing in line with modern electric clocks. The Clock men will still meet to discuss a tweak, now and then. But from Day to Sunny day, the clock will run accurately. It will be mechanically correct. Even the procession of the Sun and moon cause gravity effects which alter the clock by many milliseconds each day. These become visible with well adjusted clocks when pressure and humidity are compensated. I have designed the gravity corrections as well. They are extremely precise. The corrections for the full suite of pressure, temperature, humidity (and gravity), will make the Great clock a special image of hope in our time. It seems the more technology we have, the more dangerous and unpredictable the world becomes. My proposal to perfect Westminster Clock is just the opposite. It is engaging science and politics to make something better. Not just paint and rhetoric, but a marvolus facination and a system that rings true for all to enjoy. It will be mroe than a beautiful clock. It will be a clock with something uniquely amazing inside. Naturally, if I publish my techniques, they would be copied immediately. This paper already circumscribes them and presents the amazing opportunity. I am asking a large fee for the remarkable work. It will be a delight. And it is only a fraction of the value to society. British Tourism is 250 Billion per year. And there are at least ten major monuments. Lets say business and social travel, is 90% of tourism. That estimates Big Ben to be a hefty 2.5 Billion per year institution. The value of the clock will simply double. Though a judicious estimate gives about 4-5% perceptive improvement. Even half that (a 2% improvement) is, happily, a 50 Million (Per Year) value. This is certain. For now I will leave it to enthusiasts to contemplate these precise methods. They are very subtle. They require the right science, applied the right way. One needs a special familiarity with math, physics, horology. Hopefully decision makers will honor this sincere request. It is a wonderful humanitarian effort. It will be a comfort to behold. Truly it's Noblesse meets Obligue. The results will be beautiful. I can guarantee the clock will easily multiply attendance, bolster education and enhance tourism significantly. But that's not really the point. The enjoyable thing about clocks is knowing they work just right. And that's priceless. I have all but explained the work here. But even the best clock people might doubt the certainty of this effort. I can assure that the physics is unassailable. There are already Harrison clocks which operate within a second every hundred days. The Great clock should be tuned to a similar degree of quality. But how can the client know I will deliver what I claim, in the way that I claim? I hope my other work helps to answer that conundrum. My finding the age of the Shroud of Turin* or inventing safer smoking should light the way. 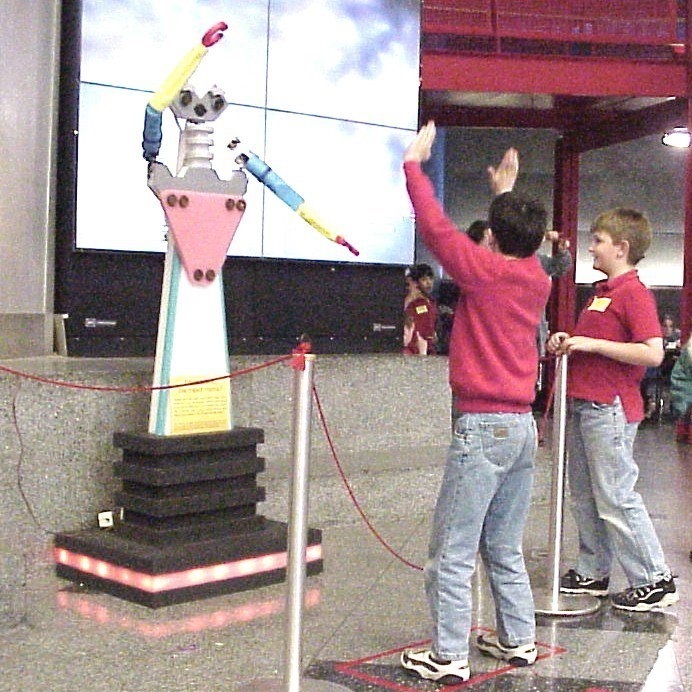 When the Franklin Institute hired me to create a feature Robot for their atrium in 2000, they were promised an 8 degree of freedom robot with 6 sonar channels and two arms which would mimic visitors arm positions, in six weeks. I don't think they expected it to be done. But it was on time and on budget. And two days early. There were 50 pages of code, 12 songs, twin 3D sonar systems, all custom electronics, dual processors and lively internal lighting for panache'. I simply had the key knowledge to do it. The Westminster clock project is much the same. The Physics is unassailable. I hope that such works are reassuring. I will admit the Robot project was 40 days dawn to dusk, impossibly laborious and virtually un-repeatable. But the clock will have maintenance and crafts support to assist in some aspects. My principle roll is engineering and implementation. But my care for the great clock will be on spec, in character and will work superbly. The Westminster clock has some excellent advantages in its massive pendulum and custom gravity escapement. So it's expected results will be very close. As a business person, I propose things which are a benifit to patrons. And I look forward to this very special public work.